Well, I suppose for my first December “food tradition” I can’t really avoid talking about the Mince Pye. The Christmas treat is mentioned at least as far back as Elizabethan times when they consisted of many of the ingredients used today but with the addition of shredded or minced meat. Oliver Cromwell considered mince pies to have a hint of paganism and were too rich and indulgent, along with other Christmas favourites. He passed an Act of Parliament in 1650 authorising the imprisonment of anyone found eating these or any form of currant pie. But they soon returned during the Restoration. Not only eaten at Christmas, the meat was left out of the pie during lent, from which we get our now traditional mince pie. The shape and size evolved through the years, starting as a large pie and then as small oval shaped pies made to represent Jesus’s manger. The tradition still remains that to ensure that you have luck throughout the year, a mince pie should be eaten on every day between Christmas and Twelfth Night. Preferably, each pie you eat should have been made by a different person and eaten in a different house. Here is your opportunity to use the pear and fig mincemeat I am sure you all dashed off to make after last months column! If not shop bought mincemeat is fine (as long as it’s local! You will also notice I haven’t stuck to the Elizabethan method. I doubt accurate oven temperatures and food processors featured in their kitchens. Sift flour, cinnamon, salt and icing sugar into a large bowl. Run in the butter or margarine with your fingertips until mixture resemble fine breadcrumbs. Roll the pastry out thinly on a floured surface. Stamp out 12x3½ inch (8.5cm) rounds and line a patty tin. Add one tablespoon of mincemeat to each patty. Stamp out 12x3 inch (7.5cm) rounds for tops. Brush one side of each top with water and place over the mincemeat, damp side down. Cut a small cross in the centre of each pie and cook for 20-25 mins, until light golden. Remove from oven and allow to cool slightly. Remove from tins and cool on a wire rack. If for immediate use, when completely cool, dust with icing sugar. 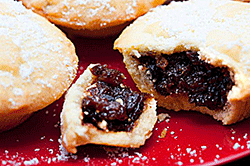 When cool, pack the mince pies in a rigid container, separating each layer with greaseproof paper. To serve cold, remove from container and allow to thaw for 3 hours, or to serve hot, place frozen mince pies in a preheated oven at 180ºC/350ºF/Gas 4 for about 15 mins. For more Christmas ideas, go to the CookBook Page and use the dropdown collections.